Biofuel is any fuel that derives from biomass — recently living organisms or their metabolic byproducts, such as manure from cows. It is a renewable energy source, unlike other natural resources such as petroleum, coal and nuclear fuels. One definition of Biofuel is any fuel with an 80% minimum content by volume of materials derived from living organisms harvested within the ten years preceding its manufacture. Like coal and petroleum, biomass is a form of stored solar energy. The energy of the sun is "captured" through the process of photosynthesis in growing plants. (See also: Systems ecology) Like all methods used to generate energy, the combustion of biomass generates pollution as a by-product. One advantage of biofuel in comparison to most other fuel types is that the energy within the biomass can be stored for an indefinite time-period and without any danger. Agricultural products specifically grown for use as biofuels include corn and soybeans, primarily in the United States, as well as flaxseed and rapeseed, primarily in Europe, and hemp is a growing crop around the world except for in America. Waste from industry, agriculture, forestry, and households can also be used to produce bioenergy; examples include straw, lumber, manure, sewage, garbage and food leftovers. Biomass used as fuel often consists of underutilized types, like chaff and animal waste. Much research is currently in progress into the utilization of microalgae as an energy source, with applications being developed for biodiesel, ethanol, methanol, methane, and even hydrogen. On the rise is use of hemp, although current politics currently restrains it. Paradoxically, in some industrialized countries like Germany, food is cheaper than fuel compared by price per joule. Central heating units supplied by food grade wheat or maize are available. Biofuel can be used both for central- and decentralized production of electricity and heat. As of 2005, bioenergy covers approximately 15% of the world's energy consumption. Most bioenergy is consumed in developing countries and is used for direct heating, as opposed to electricity production. However, Sweden and Finland supply 17% and 19%  respectively, of their energy needs with bioenergy, a high figure for industrialized countries. The production of biofuels to replace oil and natural gas is in active development, focusing on the use of cheap organic matter (usually cellulose, agricultural and sewage waste) in the efficient production of liquid and gas biofuels which yield high net energy gain. The carbon in biofuels was recently extracted from atmospheric carbon dioxide by growing plants, so burning it does not result in a net increase of carbon dioxide in the Earth's atmosphere. As a result, biofuels are seen by many as a way to reduce the amount of carbon dioxide released into the atmosphere by using them to replace non-renewable sources of energy. Noticeable is the fact that the quality of timber or grassy biomass does not have a direct impact on its value as an energy-source. Dried compressed peat is also sometimes considered a biofuel. However, it does not meet the criteria of being a renewable form of energy, or of the carbon being recently absorbed from atmospheric carbon dioxide by growing plants. Though more recent than petroleum or coal, on the time scale of human industrialisation, peat is a fossil fuel and burning it does contribute to atmospheric CO2..
Certain types of biomass have attracted research and industrial attention. Many of these are considered to be potentially useful for energy or for the production of bio-based products. Most of these are available in very large quantities and have low market value. Biologically produced alcohols, most commonly ethanol and methanol, and less commonly propanol and butanol produced by the action of bacteria — see alcohol fuel. Methanol, which is currently produced from natural gas, can also be produced from biomass — although this is not economically viable at present. The methanol economy is an interesting alternative to the hydrogen economy. Biomass to liquid, synthetic fuels produced from syngas. Syngas in turn, is produced from biomass by gasification. Ethanol fuel produced from sugar cane is being used as automotive fuel in Brazil. Ethanol produced from corn is being used as a gasoline additive (oxygenator) in the United States. Cellulostic ethanol is being manufactured from straw (an agricultural waste product) by Iogen Corporation of Ontario, Canada. Butanol is formed by A.B.E. fermentation (Acetone, Butanol, Ethanol) and experimental modifications of the ABE process show potentially high net energy gains with butanol being the only liquid product. Butanol can be burned "straight" in existing gasoline engines (without modification to the engine or car), produces more energy and is less corrosive and less water soluble than ethanol, and can be distributed via existing infrastructures. Mixed Alcohols (e.g., mixture of ethanol, propanol, butanol, pentanol, hexanol and heptanol, such as EcaleneTM), obtained either by biomass-to-liquid technology (namely gasification to produce syngas followed by catalytic synthesis) or by the MixAlco Process. Biodiesel obtained from transesterification of animal fats and vegetable oil, directly usable in petroleum diesel engines. Biogas contains methane and can be recovered in industrial systems such as anaerobic digesters and mechanical biological treatment systems. Landfill gas is a less clean form of biogas which is produced in landfills through naturally occurring anaerobic digestion. Paradoxically if this gas is allowed to escape into the atmosphere it is a potent greenhouse gas. Pyrolysis oil may be produced out of biomass, wood waste etc. using heat only in the flash pyrolysis process. The oil has to be treated before using in conventional fuel systems or internal combustion engines (water + pH). One company, GreenFuel Technologies Corporation, has developed a patented bioreactor system that utilizes nontoxic photosynthetic algae to take in smokestacks flue gases and produce biofuels such as biodiesel, bio-gas (similar to natural gas), and a dry fuel comparable to coal. One widespread use of biofuels is in home cooking and heating. Typical fuels for this are wood, charcoal or dried dung. The biofuel may be burned on an open fireplace or in a special stove. The efficiency of this process may vary widely, from 10% for a well made fire (even less if the fire is not made carefully) up to 40% for a custom designed charcoal stove1. Inefficient use of fuel may be a minor cause of deforestation (though this is negligible compared to deliberate destruction to clear land for agricultural use) but more importantly it means that more work has to be put into gathering fuel, thus the quality of cooking stoves has a direct influence on the viability of biofuels. "American homeowners are turning to burning corn in special stoves to reduce their energy bills. Sales of corn-burning stoves have tripled this year [...] Corn-generated heat costs less than a fifth of the current rate for propane and about a third of electrical heat"
The methane in biogas is often pure enough to pass directly through gas engines to generate green energy. Anaerobic digesters or biogas powerplants convert this renewable energy source into electricity. This can either be used either commercially or on a local scale. 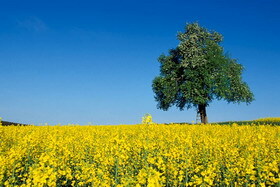 In Germany small scale use of biofuel is still a domain of agricultural farms. It is an official aim of the German government to use the entire potential of 200,000 farms for the production of biofuel and bioenergy. (Source: VDI-Bericht "Bioenergie - Energieträger der Zukunft". Different combustion-engines are being produced for very low prices lately . They allow the private house-owner to utilize low amounts of "weak" compression of methane to generate electrical and thermal power (almost) sufficient for a well insulated residential home. Unfortunately, much cooking with biofuels is done indoors, without efficient ventilation, and using fuels such as dung causes airborne pollution. This can be a serious health hazard; 1.5 million deaths were attributed to this cause by the World Health Organisation as of 2000 2. There are various responses to this, such as improved stoves, including those with inbuilt flues and switching to alternative fuel sources. Most of these responses have difficulties. One is that fuels are expensive and easily damaged. Another is that alternative fuels tend to be more expensive, but the people who rely on biofuels often do so precisely because they cannot afford alternatives. 3 Organisations such as Intermediate Technology Development Group work to make improved facilities for biofuel use and better alternatives accessible to those who cannot currently get them. This work is done through improving ventilation, switching to different uses of biomass such as the creation of biogas from solid biomatter, or switching to other alternatives such as micro-hydro power. Direct biofuels are biofuels that can be used in existing unmodified petroleum engines, like biodiesel and biobutanol. Another direct biofuel is E10 (in the US) - however, most cars, evev those built prior to 1988, will run on E5 and apparently E20 can be used in most post-1988 American cars without modification. Other than biodiesel, biobutanol and bioethanol, few direct biofuels, if any, exist. On the other hand, recognizing the importance of bioenergy and its implementation, there are international organizations such as IEA Bioenergy, established in 1978 by the International Energy Agency (IEA), with the aim of improving cooperation and information exchange between countries that have national programs in bioenergy research, development and deployment.